Three children went out to play. Only two came back, Laurel and Primrose, the Flower Girls. One is convicted of murder, the other given a new identity and a new life. 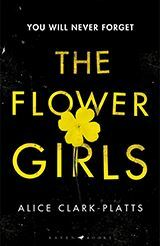 Now, nineteen years later, the Flower girls are about to hit the headlines all over again. Another child has gone missing. It’s New Year’s Eve, a fierce ice storm has isolated guests and staff in a remote Devon hotel and they are all under suspicion. Alice Clark-Platts introduces her characters with flair as the claustrophobic atmosphere draws out their private fears and secrets. The focus switches to fragile, pretty Hazel when it is discovered she was involved in the murder of a child, many years before. Terrified that she will lose, Jonny, the love of her life, she does not realise that Jonny is not what he seems. While the police are unable to find any evidence of a crime, this earlier murder becomes the only clue to what really happened in Devon. As Detective Sergeant Hillier studies the people entangled in the past tragedy, the lies and manipulations build towards a surprising climax. There’s the uncle who stands by the imprisoned child as she grows into an abandoned bitter adult; the crusader, determined her niece’s murderer will never see freedom; the opportunistic writer who senses a chance at a best seller; and the two Flower girls locked in a bitter battle, trying to unravel the impact of a cold-blooded child murderer in their lives. As Hazel’s life unravels in the intense public glare, she realises anew that it is not enough to be acquitted. In this world of judgement by mass media, you have to be seen as innocent as well. The complex plot and varied characters rarely connect, each operating in their own little bubble so that the frequent switches in time and story can be confusing. It helps that Alice Clark-Platts captures vital moments of insight and revelation in vivid language. Detective Hillier ‘faces the mask of innocence and knows, right down to the marrow in her bones, that it is a lie.’ Only at the chilling climax do we understand what true evil can be. This novel masquerades as a police procedural but it draws us a long way away from any tired formula. The characters are not necessarily likeable but I was drawn into the different stories so thoroughly, I couldn’t put it down until the final reveal of where truth and innocence actually lay.